It happens to every small and mid-sized company. You don’t know where it’s going to happen or when, but you know it will happen. You hit “The Wall.” We call it “The Growth Barrier™. The Growth Barrier marks the beginning of what is often called No Man’s Land – where you’re company is too big to be small, but too small to be big. The Growth Barrier is a dangerous time in your company’s life because the very rules, actions and habits that allowed you to grow and be successful either no longer work, or are not enough to work. In this phase of a business’ life cycle, experience can work against you. To maintain growth you must enter new markets, deal with new challenges, solve new customer problems, and manage constant change. The result, too often, is increased competition intensity and an increased rate of commoditization, putting even more pressure on your margins. 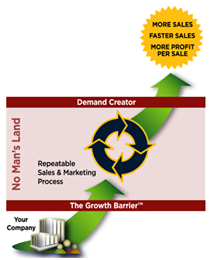 There is only one way to predictably break through The Growth Barrier: the creation of a sustainable and repeatable sales and marketing process that is not reliant on specific individuals or unique talent to be successful. The only way to beat back commoditization is to become a Demand Creator. Imagine Business Development’s team of Field Guides provides growth-oriented companies the expertise in strategy, sales and marketing and the leadership to break through The Growth Barrier. Our unique programs enable small and mid-sized businesses (SMEs) to experience more sales, faster sales, and more profit per sale. The INTELLIGENT Growth Program™ enhances the capabilities and creativity of your company – enabling you to develop the customized repeatable process needed to break through The Growth Barrier. The 25/25 Program™ transforms your salespeople, or selling organization, into Demand Creators and enables them to increase their results by 25%, while reducing the effort it takes to get those results by 25%.